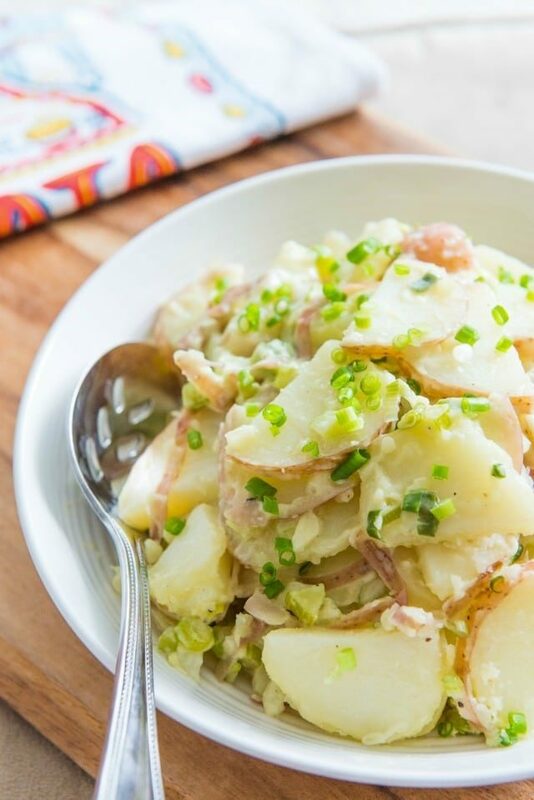 There are a thousand and one ways to make potato salad, and over the years I’ve tried many of those ways. There are so many types of potatoes you can use, not to mention the different types of dressing. 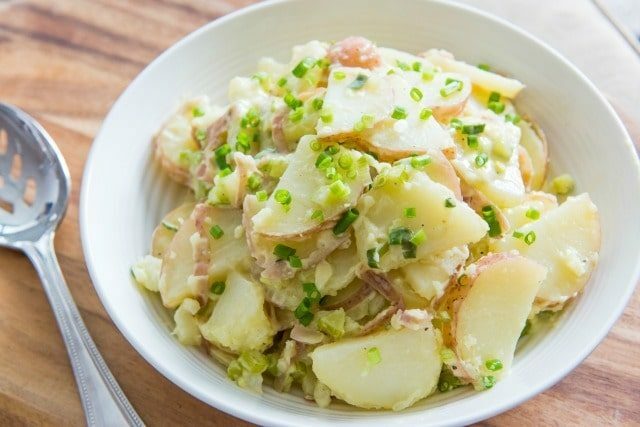 But when it comes to making potato salad to take for a party or a potluck, this is the way I typically like to make it. I can’t tell you how many times people have told me that they liked my dressing because it wasn’t crazy heavy on the mayonnaise, but still had good moisture and flavor. When I bring potato salad to a potluck, I like to use red or yellow potatoes cut into thin half-moon slices, instead of chunks. When you’re cutting several pounds of potatoes, I think it’s easier to move through the knife work if you’re slicing the potatoes as they lay flat on the board, instead of trying to cut lots of chunks that are the same size. Hi Joanne! I made this potato salad for a Father’s Day celebration this weekend and it was delicious! Everyone loved it 🙂 I love how simple it is and the fact that there’s no egg in the recipe. After it cooled, it seems to be lacking some salt. Otherwise… fantastic. Thanks for the recipe & my first potato salad! Glad to hear it turned out well! I always find I have to be very aggressive with the salt when it comes to potatoes, so hopefully you were able to adjust.